This website began as a discussion topic on an Australian Shepherd list. A small circle of list members combined their talents to pull together some information on white Aussies. Our goal was to produce educational materials, for everyone's benefit. The first project was to create a brochure. This brochure is available for anyone who wants it, to hand out wherever they wish. As we were working on it, we realized the limitations: there was so much more information that we wanted to include, but size constraints prevented us from doing so. So the idea of a website was born. This website exists to help explain white coloration in dogs, as clearly as possible. It was constructed by Aussie folks, which explains why Aussies compromise the majority of the pictures! Some of the terminology is Aussie specific as well. Please be advised though, that much of the information is truly applicable to other breeds as well. There are many pictures on this site, so some of the pages may be a bit slow to load. All of the photos with blue borders are links to a page with more pictures and information on the dog featured. Links off-site (which are this color) will open a new browser window (just close it to come back here). It is our sincere hope that you will find this site (and the brochure) helpful. Now, on to the topic at hand! Why is the site called "lethal whites"? We decided to use this as the site's url because this term is so commonly misused by Australian Shepherd people (and others too, unfortunately). We wanted to provide the opportunity for folks to find the facts. Lethal White is properly used to describe a condition found in horses, but it is not a correct term for an excessively white dog. There are basically two ways for Australian Shepherds to have too much white in their coats. The first is commonly called Pattern White, and the second is called Double Merle. Neither one is a form of albinism. We also have a section devoted to explaining merle coloring, since it is linked to the problems with white (and confuses a lot of people). Please note: sadly, these dogs are not "rare" nor "valuable" (in a monetary sense). While you won't see "white" Aussies in the show ring (or pictured in very many "about the breed" books), they are easy enough to find. The Australian Shepherd breed standard (and many other breed standards - see our links page) restricts the amount of white that a dog can carry, and with good reason! Read through this website (and check out the sites that we recommend) to find out why. 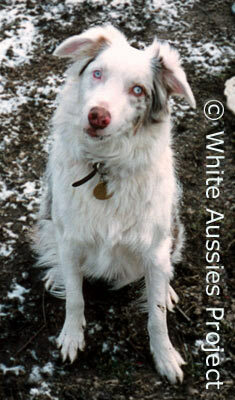 "White" is not a color that any responsible Australian Shepherd breeder would strive for or advertise about.